Halloween is just around the corner and if you are planning to buy a costume, now is the time. As the day draws closer, the selection really starts to dwindle and instead of being one of the girls from Frozen, your darling daughter will have to settle for the cupcake costume in the back. Sure, it’s cute, but see how well it goes over. This year I won’t be dressing up. With Cecilia only being two months old at Halloween, I considered not dressing her up either. It seems kind of silly to spend $20 on a costume for a baby and the selection is very limited at this age. On the flip side, it’s Cecilia’s first Halloween so how could we not dress her up? It’s funny how things like practicality go right out the window when you’re doing something for your children. I went to Target and didn’t see anything that I liked for infants so I decided to make her a costume. Mr. P suggested that she dress up as a ladybug this year so ladybug it is. While this makes for a great Halloween costume, it could also be used for a ladybug party! Check out some of our other ladybug party ideas here! 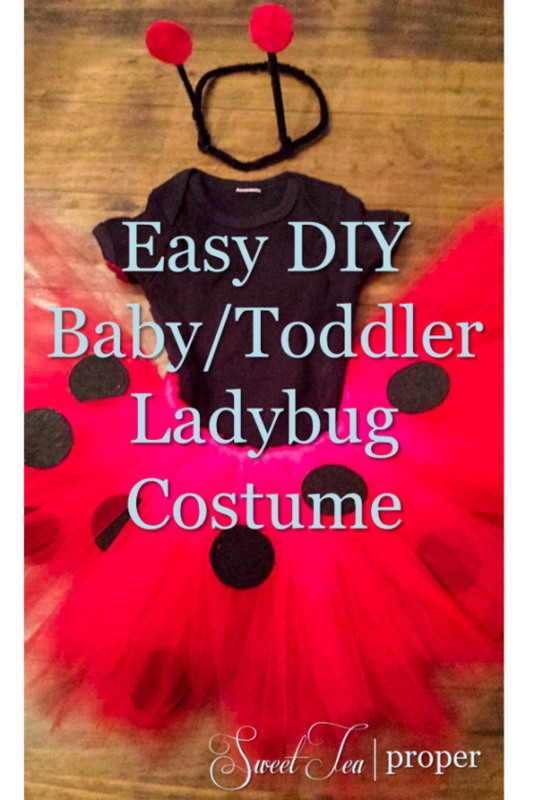 This ladybug costume consists of three parts – a black onesie, headband, and tutu. I opted out of making wings since Cecilia spends the bulk of her day lying down. However, if you are making this costume for a toddler, wings are a must and can be found at most party stores for pretty cheap. We purchased all of the materials needed at Hobby Lobby for around $10. We didn’t have any of the needed materials and the onesie alone was $3.50 so this is a very affordable costume option. Please excuse the pictures as they were taken from my cell phone. If you’re questioning whether you can do this, know that this project is so easy that I completed it with a sleeping baby on my lap. YOU CAN DO IT! The first item we are going to make is the tutu because it is the main part of the costume. If you are a crafty and the mother to a girl, learning to make a tutu is a must. Not only is it easy, but there are so many fun costumes that can be made from it. The first thing you will need to do is measure the waist of the person that you are making the tutu for. Then cut that length from your elastic band plus two inches. Add you start to make the tutu, the elastic stretches less so it’s nice to have a little extra wiggle room. If you find at the end that you don’t need the extra elastic, you can cut it off, but it’s better to have it available just in case. The next thing you will want to decide is how long the tutu should be. 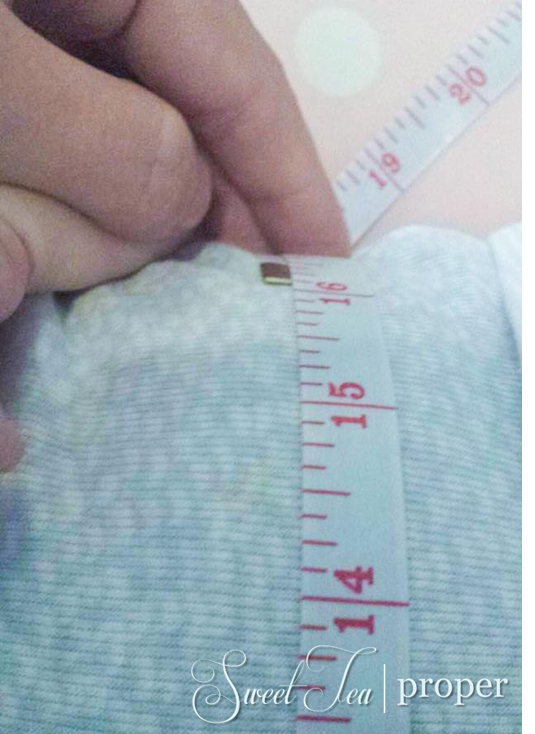 The best way to determine this is to measure from waist to knee, ankle, etc. For Cecilia’s, I decided that ten inches seemed appropriate. *After completion, I changed my mind and ten inches seemed too long for her. If this happens to you, don’t panic, carefully trim off the amount from the bottom of the tutu. Whatever desired length you decide on for the tutu, double that number. If you want a ten inch tutu then you will need twenty inch tulle pieces. 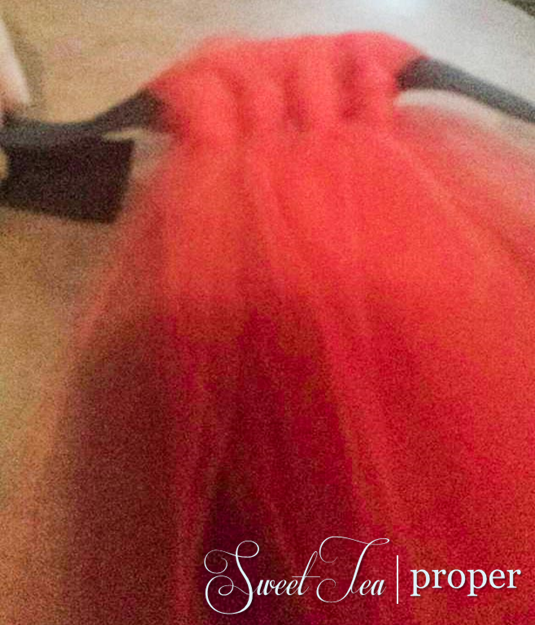 Measure out the tulle and cut strips to the desired length. I like to cut out 10 – 20 strips at a time. You can cut the entire roll or work in sections. When starting the tutu, you can begin on one side or the middle. It really doesn’t matter as long as you make sure to leave about an inch on each side open. I started in the middle. Taking the tulle, fold one piece in half. Lay the elastic band on top of it and pull the tail end pieces through the loop. Pull to secure the knot. Continue adding the tulle pieces until you reach an inch left on each side. It really doesn’t matter if you pull though over or under, but you will want to remain consistent. If you mess up and do some with the elastic under and some with the elastic over, you will end up seeing some of the knots on the finished side. That is not what we are trying to achieve. Below is what the “knotted” side will look like. As you work, pull the knots closer together for a fuller look. You should now have the basis for a red tutu competed. 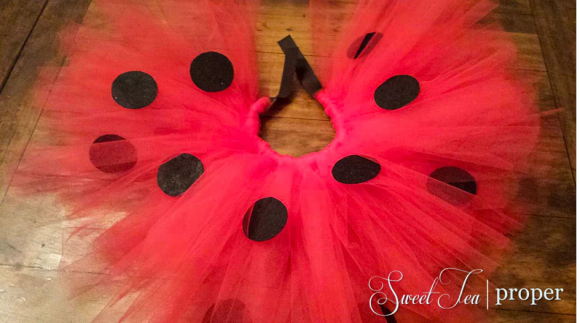 Since this tutu is for a ladybug costume we need to make some spots. 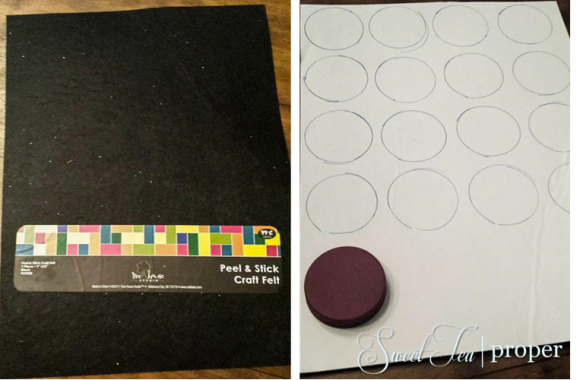 Flip the black felt over and trace small circles on the back. I used a lid from a container of vitamins. Cut out a dozen or so small spots, depending how big or small your lid is. If you don’t have a small lid, just cut out the circles the best you can. It doesn’t have to be perfect. What real ladybug has perfect spots? One by one peel the felt off of the sheet and press the circle felt side up onto a strand of the tulle. You may have to double up the tulle underneath to absorb all of the stickiness from the sheet. Continue adding the spots throughout the tutu. Once complete you have to decide how you would like to close it up. 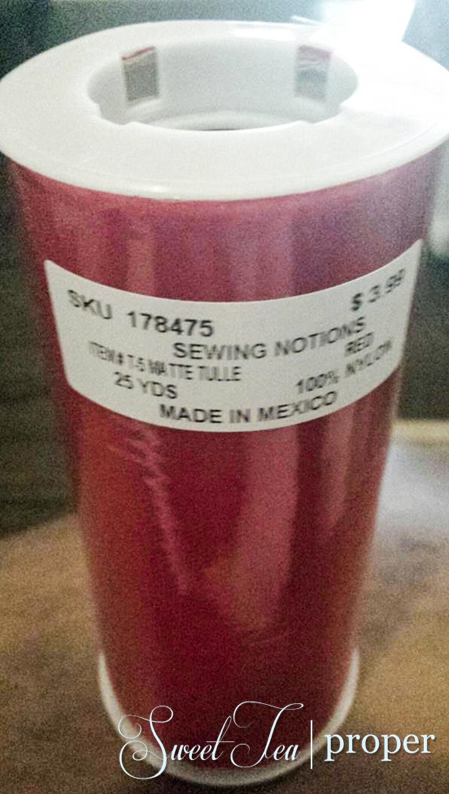 We are using a safety-pin so it can be easily adjusted larger or smaller if desired. For a more permanent attachment, you could sew the two end pieces together or add Velcro to each end. Whatever you decide to go with, give yourself a pat on the back. The hard part is over. Now the only thing left to make is the headband. Take the black pipe cleaner (I needed two pieces) and wrap it around the child’s head to get the desired size. Twist the ends together, connecting the two pieces of pipe cleaner together to make a circle. For the antennas, cut two more pieces of pipe cleaner. These should be no more than four to six inches long. Take one of the pipe cleaners and wrap one end around the pipe cleaner headpiece so it sticks up. You will need to wrap it several times to achieve this. Do the same with the other pipe cleaner about three to four inches away from the first one. There are two easy options you can do for the tops of the antennas. The first is to attach a fuzzy pompom to the top with a hot glue. In hindsight, I would’ve preferred this method. The other option is to cut out four small circles out of the red felt. You will use two circles per antenna. Remove the felt from the backing and press one of the circles about half an inch down onto one of the antennas. Flip it over and press another circle onto the first circle sticky side down. Continue on the other side. There you have it – one easy (and cheap!) 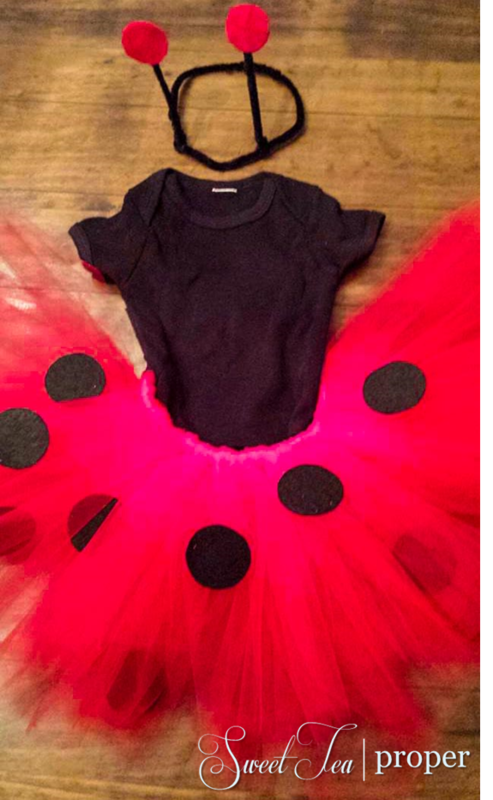 DIY baby or toddler ladybug costume complete!